We've all had our share of mobile drives. Zip drives are possibly the most common. 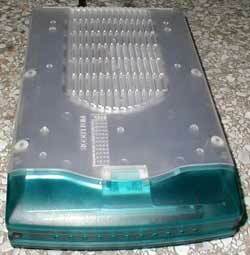 They plug into the parallel port, something every PC has, and the disks are cheap. But just as floppies have become obsolete for anything short of flashing a BIOS because of their small capacity, Zips have become ineffective for most mobile storage uses because 100 MB is not enough space for most files. Sure, Zips are now available as a 250, but they don't work as 250 MB disks in earlier Zip drives and the disks cost more. Jaz drives are faster and hold more, but the drives and disks are quite expensive. CDs? Good idea. CDRs are cheaper then ever, can be made mobile with an enclosure and blanks are certainly cheap. But burning CDs are still a slow process, especially in an external enclosure. How about a hard drive in a portable enclosure? Portable hard drives are not a new concept at all. Parallel port units have been around for ages. Over 6 years ago, I had a parallel enclosure for my hard drive, but now we are in the age of USB and not too soon, either. Hard drives have become very inexpensive as well. So what do you get when you put a $70 20GB hard drive in a $100 portable USB enclosure? You get beaucoup storage space at fairly decent speed! Another problem I had with the enclosure was the false sense of security that the enclosure gives you as far as the durability of the unit, in it's entirety, actually is. Not that I would ever forget that there's a fragile hard drive in this thing, but it's portability often can imply a degree of durability, and that degree of ruggedness just isn't there. 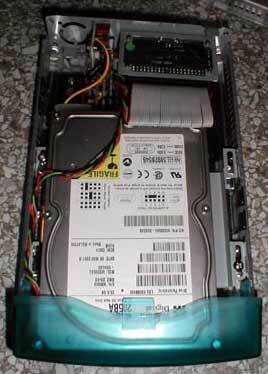 There's still a hard drive in that case, and it's still susceptible to data loss or complete failure if you drop it. The unit certainly looks rugged with it's thick clear plastic cover and metal shielding inside, but the fact of the matter remains; it's still a hard drive. Overall, the Mapower MAP-63C enclosure wins with me. It's VERY portable and HIGHLY compatible and pretty fast when compared with other means of external data storage. The unit even LOOKS cool. I can easily give this drive an overall SystemLogical rating of 9 out of 10 and it's likely not to get knocked out of that spot until a faster unit is brought to my attention and tested. Certainly a Firewire unit would be faster, but how many PCs do you have in your house that has Firewire?